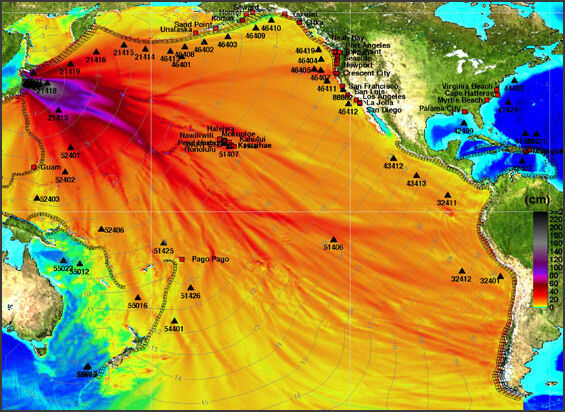 The earthquake that struck northern Japan on March 11, 2011 was an ocean trench earthquake. Scientists assume that a quake of this size only occurs once in about 600 years on average. The epicenter was in the ocean about 130 kilometers off the Sanriku region, east-southeast of Miyagi Prefecture’s Oshika Peninsula, according to the Japan Meteorological Agency. The ground moved 5.3 meters eastward and fell by 1.2 meters on Oshika Peninsula. The 9.0 earthquake lasted for several minutes. It not only violently shook the ground and generated a devastating tsunami, it also moved the coastline and changed the balance of the planet. Global positioning stations closest to the epicenter jumped eastward by up to four meters. Later the Japan Coast Guard found location markers on the seabed near the quake focus---120 kilometers off the Oshika Peninsula northeast of Sendai, at a depth of 1,700 meters---had shifted 24 meters east-southeast. The closest piece of land to quake epicenter---the Oshika Peninsula northeast of Sendai---moved 5.3 meters and subsided 1.2 meters. Chiba Prefecture near Tokyo shifted 17 centimeters east. The plate boundaries had been firmly wedged against each other, but as one tectonic plate gradually subducted the other, stress built up at the boundaries and caused them to break apart. The removal of this small "seal" that had held the plates in place resulted in them separating along an area stretching about 400 kilometers, according to the researchers. The team of researchers from Shizuoka University and the National Institute for Earth Science and Disaster Prevention reported their finding last week at a Seismological Society of Japan conference in Shizuoka. The March 2011 earthquake occurred where the Pacific plate subducts another plate beneath the Tohoku region. The quake's hypocenter was off Miyagi Prefecture, and its hypocentral region was about 400 kilometers long and about 200 kilometers wide. 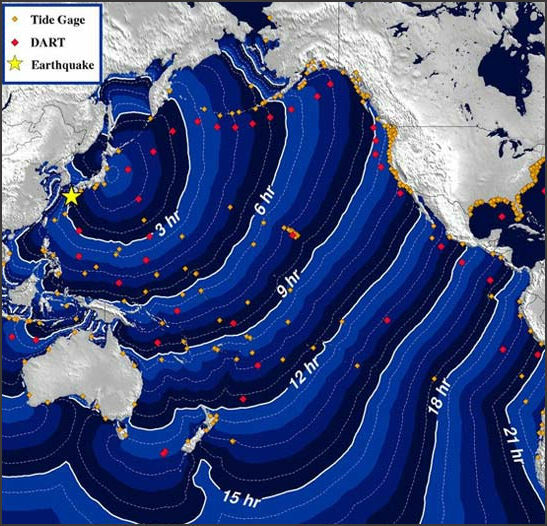 Ryoya Ikuta, assistant professor at Shizuoka University, and other experts focused on the strength of the connection between plate boundaries, which can be a cause of seismic activity. They analyzed data on crustal movements taken from the Global Positioning System over the 15 years up until the earthquake. Their research revealed that plate boundaries in an area covering several dozen square kilometers about 100 kilometers off Oshika Peninsula, Miyagi Prefecture, had been firmly "jammed" together. This area was close to the epicenter of the magnitude-9 quake. The researchers believe the area moved 30 meters when the earthquake occurred, adding that the plate boundaries had possibly been stuck snugly together for several hundred years. The Okhotsk tectonic plate, on which the Tohoku region lies, is gradually being subducted by the Pacific Plate in a westerly direction, building up stress at the plate boundary.This stress accumulates in a relatively short period of time because the plates "jam" strongly and stick because of the way their surfaces are formed. However, this stress is released infrequently. The Japan Trench, where the 2011 earthquake occurred, is deeper than the Nankai Trough (another place where large earthquakes occur), with its subduction progressing at a sharper angle. For this reason, scientists believed the land-side plate would not be pulled too greatly below the sea-side one, and that a massive quake would be unlikely there. They were wrong. By utilizing data on frequently occurring small earthquakes off the Tohoku region and Global Positioning System data on the speed at which the plates move, Uchida was able to work out the likelihood of the plates in the hypocentral region jamming. He was then able to calculate the timeframe in which enough strain accumulates to cause a magnitude-9 class earthquake based on data obtained through the above process. According to a study on the frequency of tsunami based on analyses of geological strata, tsunami caused by huge earthquakes are likely to have had hit the Tohoku coastline in intervals of 500 to 1,000 years. "We need to consider there may be cases in which the energy [stresses] accumulates in a period shorter than that," Uchida said. Cracks have been found in seabed 170 to 200 kilometers off the coast of Miyagi and Iwate Prefectures at sites at depths from 3,200 meters to 5,350 meters that are believed to have created by the earthquake. One of the cracks is 20 centimeters wide and several meters long. The cracks were found and photographed with the Shinkai 6500 manned submarine, which is capable of descending to depths of 6,500 meters below the ocean surface. In December 2011, The New Scientist reported that Tohoku earthquake produced shock waves powerful enough to knock satellites out of their orbits. Two affected satellites--- part of a research project called GRACE (Gravity Recovery and Climate Experiment)--- follow similar orbits about 136 miles apart, while taking ultra accurate readings of the distance between them, and any changes in the surrounding magnetic field. Following the March earthquake, these variations grew to double their normal level as the satellites passed over the earthquake zone. These weren't just any satellites: they are the twin spacecraft of the Gravity Recovery and Climate Experiment (GRACE), which fly 220 kilometres apart in a polar orbit about 500 kilometres above Earth. GRACE's job is to map the Earth's gravity field, and it does this by monitoring the effect of minute variations in the field on the trajectories of the satellites and the changing distance between them. Earth's gravity field changes whenever there is a redistribution of mass on its surface. This may be a result of snowfall, flood, melting of ice caps---or earthquakes. "That perturbed gravitational field affects the satellite orbits," explains Shin-Chan Han of NASA's Goddard Space Flight Center in Greenbelt, Maryland. The researchers calculated how the relative velocity of the two satellites changed as they passed over the affected region. GRACE records variations in the gravity field due to other processes too, but these background signals change over larger time scales than that of the quake, and so could be identified and subtracted. NASA and the German Space Agency DLR who jointly operate the GRACE program, now feel that this discovery will lead to a more accurate way to measure the magnitude of large earthquakes. The aftershock zone covers an area measuring about 600 kilometers north to south from the coast of Iwate Prefecture to Ibaraki Prefecture and about 350 kilometers from east to west. The agency has defined earthquakes with a focus in this region as aftershocks of the March 11 earthquake. It also warned that aftershocks measuring lower 5 or stronger may occur in the area in the future. In the wake of the disaster, there were 109 aftershocks with an intensity of 4 or higher last March, followed by 50 such aftershocks in April, and six last month. Although the frequency of aftershocks is on the decline, seismic activity is still occurring in the area. An aftershock measuring lower 5 with a focus off Ibaraki Prefecture occurred on March 1. In the one-year period after the March 11 earthquake aftershocks with an intensity of 1 or higher occurred 7,225 times in the area. These aftershocks accounted for about 70 percent of the 10,120 earthquakes measuring 1 or stronger during the same period nationwide. Outside of the aftershock zone, 18 earthquakes measuring lower 5 or stronger were recorded nationwide, with focuses in Shizuoka, Nagano, Akita prefectures and other locations. The agency believes seismic activities have become more frequent across the country. Yoshimitsu Okada, president of the National Research Institute for Earth Science and Disaster Prevention, told the Yomiuri Shimbun, "Aftershocks of the March 11 earthquake occurred in shallow places in the Earth's crust and triggered other aftershocks....The frequency of earthquakes has increased by aftershocks caused by aftershocks of the March 11 earthquake.” In March 2011, a government panel of volcano experts said it was unlikely that aftershocks would cause Mt. Fuji or any other volcano in Japan to erupt. Hot springwater suddenly began pouring from this defunct coal mine ventilation shaft in Iwaki, Fukushima Prefecture, following aftershocks from the Great East Japan Earthquake in April. Kazuhiko Nakamura, 54, proprietor of the long-standing Choseikan hot spring inn in Yahikomura, Niigata Prefecture, said the water stopped flowing from the inn's well just hours after the magnitude-9 earthquake. Expert examinations conducted at Nakamura's request found there was little chance the hot water would start to flow again, leaving him with no choice but to close the inn. Clear springwater turned milky white after the earthquake at Fukuroda Onsen Sekisho no Yu, a hot spring day spa in Daigomachi, Ibaraki Prefecture. The curious change has become a boon for the facility, which has experienced a marked uptick in visitor numbers. Many guests have remarked on the quality of the springwater and how it makes their skin "silky smooth," according to a staff member. Why the springwater changed color is unknown--one onsen development company suggested the impact of the earthquake may have caused clay to mix into the layer of earth from where the hot spring originates. Day by day, the springwater is gradually returning to its original clarity, to the disappointment of the spa and its customers. At a defunct coal mine shaft in Iwaki, Fukushima Prefecture, a torrent of hot springwater is gushing from a cylindrical concrete ventilation passage located on a vacant lot that is just 20 to 30 meters from a residential block.The water, which is about 55 C, started pouring out following aftershocks on April 11 and 12 that registered lower six on the Japanese seismic scale of seven. Several thousand tons of springwater has been pouring every day from the passage. The company charged with administering the about-600-meter-deep mine shaft has dug a ditch to channel the water away from nearby residences. The National Institute of Advanced Industrial Science and Technology, a government-affiliated research body, has been observing 82 natural groundwater reservoirs at 48 locations in the Izu area of Shizuoka Prefecture and the Shikoku region to gauge possible effects of future earthquakes in the Tokai region and elsewhere. According to the institute, water levels--not volume--in 70 percent of the reservoirs fell after the March 11 earthquake, because the ground was "stretched," distributing the water over a wider area. Conversely, in the aftershocks in April, the ground is thought to have been "compressed," causing the reservoirs to narrow and thus force the springwater out, institute researchers said. Usually, groundwater conditions return to normal over time after being disrupted by seismic activity. This time, however, considering the extraordinary power of the Great East Japan Earthquake, some of its effects on hot springs may be permanent. Atmospheric Temperature Spiked Before the Earthquake, Could This Have Helped Predict the Quake? Prof. Kosuke Heki of Hokkaido University, a researcher of geophysics, checked changes in the density of electrons in the ionosphere using electric waves from Global Positioning System satellites. He found the density over the epicenter rose by up to 10 percent compared with other areas from 40 minutes before the magnitude-9 quake. A similar phenomenon occurred just before a magnitude-8.8 quake in Chile in 2010 and a magnitude-9.1 quake off Sumatra Island, Indonesia, in 2004. However, the electron density was only marginally higher before a magnitude-8 quake struck off Tokachi area, Hokkaido, in 2003. "Though we don't know why this happens, it could be an effective way to forecast a big earthquake just before it occurs," Heki said. Masashi Hayakawa, professor emeritus of the University of Electro-Communications, believes the changes in the ionosphere started "about five days before the quake." Hayakawa, who researches the relationship between earthquakes and electromagnetic phenomena, said distortions in the ionosphere were detected by analyzing the transmission of radio waves in the air. He said this was because cracks that occur in the Earth's crust just before an earthquake cause vibrations that pass through the air. According to Hayakawa, the phenomenon occurs from about a week before an inland earthquake of magnitude 6 or larger with a focus up to 40 kilometers underground. Despite this, no clear precursors were detected from movements of the Earth's crust before the March 11 temblor. An earthquake occurs when crustal plates that cover the Earth's surface rub against and bump into each other, causing a buildup of pressure that is eventually released as a quake. There are about a dozen such plates. The Tokai Earthquake, which is predicted to strike off Suruga Bay, is expected to be preceded by a "precursor slide" triggered when pressure that has built up along the boundaries of two plates causes one of them to slip under the other. Observation equipment has been set up to monitor any movement of the crusts. A precursor slide did not occur before the Great East Japan Earthquake, even though it was the same kind of plate boundary quake as the Tokai quake is predicted to be. However, on March 9, two days before the disaster, a magnitude-7.3 quake--which is considered a foreshock of the March 11 quake--occurred close to the latter quake's epicenter. The epicenters of several aftershocks of the March 9 quake formed a line moving toward that of the March 11 quake. Nagoya University Prof. Koshun Yamaoka, a seismologist, said, "The quake two days before definitely triggered the disastrous quake." But whether an earthquake is a precursor of a bigger one only becomes clear after the more powerful one has occurred. "Even if we knew of an area where a magnitude-9 quake could occur, forecasting when it might strike would still be difficult," Yamaoka said. The magnitude-7.3 Haicheng Earthquake in China in 1975 was reportedly successfully forecast by observing prior seismic activity, crust movements and unusual animal behavior. Although increasing attention is being paid to phenomena that could be warning signs of an upcoming disaster, only a handful of major earthquakes have been successfully forecast before they unleashed their destructive force. Did Animals Give a Warning of March 11 Earthquake? The research, the first of its kind, will be conducted next spring at the earliest. The team hopes the study will be the first step in revealing the mechanism of the magnitude-9 earthquake. The Japan Agency for Marine-Earth Science and Technology, the owner of the Chikyu, will participate in the research from Japan. The research will be one of the projects conducted by the Integrated Ocean Drilling Program, which comprises Japan, the United States and 22 other countries. According to scientists, the tectonic plates are believed to have moved more than 20 meters near the Japan Trench. However, it is unknown why they moved so much. Some scientists pointed to the possibility that faults branching off from the boundary of the plates also moved, intensifying the tsunami. The research team believes frictional heat remains at the boundary of the plates and the faults for one or two years after the plates moved. The research team will measure the temperature of the rock and study any deformity caused by heat to learn which faults moved at the time of the earthquake. The team will also study how far the boundary and faults moved, and the speed of the movement. It will also analyze how stable the plates were before the March 11 earthquake. The institute said that since the March 11 disaster, pressure on the tectonic plates beneath the city has changed and two or more focal areas may move simultaneously, resulting in a massive quake. The average number of quakes measured at magnitude 3 or more in the five years preceding the March 11 disaster was about eight a month.The institute discovered that the number of small-scale plate-boundary quakes that are not felt by people has drastically increased following the March 11 earthquake. Also, the preliminary observed number of magnitude-3 or larger plate-boundary quakes between March 11 and Aug. 20 rose about fourfold in an area 60 to 70 kilometers below northern Tokyo Bay. Similarly sized plate-boundary quakes occurring 40 to 55 kilometers below southern Ibaraki Prefecture have increased about 20-fold. The number of inland quakes has not drastically increased, but the institute said the types of the quakes have clearly changed. 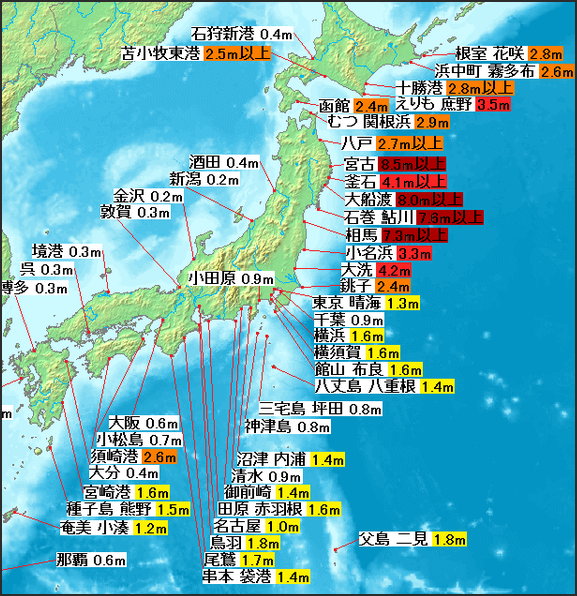 There have been huge quakes with shallow focal points below Tokyo and surrounding areas in the past. The 1923 magnitude-8 Great Kanto Earthquake occurred in southern Tokyo Bay. The government's Central Disaster Management Council has maintained that magnitude-8 quakes will not occur in the near future. 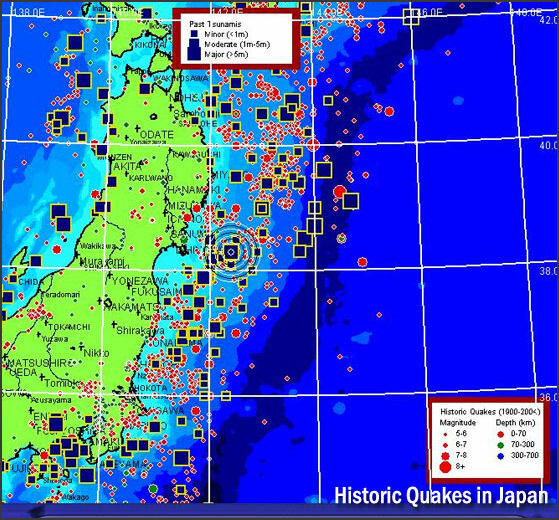 But the Great East Japan Earthquake has largely changed conventional thinking about the region's seismology. Naoshi Hirata, a researcher at the institute and a member of the government's Earthquake Research Commitxtee, said, "If there is drastic plate movement, there is no guarantee that the scale of the quake will be in line with the government's prediction of up to magnitude 7.3. "In addition to looking at the intervals of recurrence of Great Kanto Earthquake level quakes, it's necessary to review the predictions," he said.